The best practices and latest technology in farming are used in order to obtain the best results and achieve the pursued quality. Fully closed and insulated poultry houses are used, with totally controlled internal environment, providing the best conditions for the birds. Innovative and technologically advanced computer systems control the fully automated feeding, watering, lighting, heating, ventilation and cooling systems, centrally inform the management of any problems or malfunctions during the growing period, day and night. In such conditions, the performance is optimum. Not only do we achieve best results and quality products, but we also comply with the strict European Union regulations pertaining to animal welfare, which is a priority issue on the list of all European countries. The company owns and operates a modern egg-production farm and packing center. Automated systems allow for the comfort of the laying hens and provide the best conditions for top laying performance. Technology plays a vital role here in achieving the set goals which are the production and supply of first class products and comply with all regulations pertaining to the animal welfare and the production of safe products for the consumer. The packing center comprises of automatic grading, candling and packaging of eggs in various pack types all in Mintikkis brand. In 1997 the company decided to build a modern slaughterhouse that would fully comply with EU regulations. The project was completed in 2000. With hard work and commitment to be the best in the sector and to provide the safest products, we applied all the available practices regarding hygiene and quality control. We were the first to apply the HACCP system which was later certified by an external certifying body. In 2007 we applied the new food safety system ISO22000 that was also certified. In this plant we process whole chickens and cuts in both fresh and frozen condition. 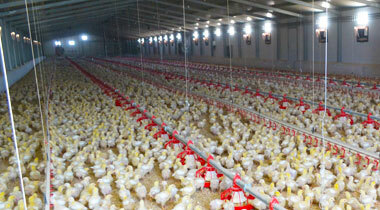 About 90 people are employed in the plant, which has a capacity to process 20000 chickens a day. Always having in mind that we should deliver effectively and efficiently and keep the cold storage chain intact, we have invested in a most technologically advanced fleet of vehicles in order for our clients to receive our products in the best possible condition. Best practices in loading and keeping control of temperatures have been applied. Central real time tracking system has been placed in operation so as to keep track of the whereabouts of each delivery truck at any moment and closely monitor temperature recordings. Additionally and in order to handle and process orders in the most efficient way, we operate a central warehousing management System (WMS), which allows for the smooth and reliable operation of the company's logistics. Our company has set up modern and functional premises for the production of various chicken meat products. With our controlled and cooled production areas and in strict compliance with all relevant regulations on the hygienic production of such products, we are able to offer consumers a wide range of quality products, in order to satisfy even the most demanding requirements. The implementation of quality assurance system FSS C22000 enables the production of perfectly safe and quality products. In such facilities, we produce products such as chicken burgers, marinated chicken wings, breaded wings, marinated fillets, nuggets etc. A Retail Outlet operates at the entrance of our facilities, at Marki. 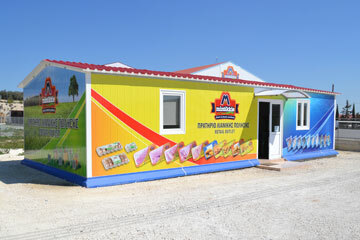 At our outlets you can find a wide range of the company’s products, such as chickens and eggs, as well as imported products that "A. Mintikkis Farm Ltd" offers to the Cyprus market. A second outlet operates in Dasoupoli, at Andreas Avraamides street, where you can find all of our products that are available at the Marki outlet, as well as butchery for fresh meat.